Fairfax County's registrar probably knows as much about the system as anyone, and even he says, "Your eyes get a little bit blurred." Find out what he and other elections officials think can be done in the wake of a Virginia House election that had more incorrectly assigned voters than the margin between the two candidates. WASHINGTON — Pointing to a whiteboard marking the example districts of Winterfell and Westeros alongside a series of houses circled in red and other district boundaries, Fairfax County Registrar Cameron Sasnett recently attempted to explain how voters are assigned to one district or another in Virginia’s state voter registration database. It took about a half-hour. “You have USPS [Postal Service] street [segments] talking to a system that needs to work off a map that is not there, that’s working off descriptions that were used from a different map,” he summed up. While all of the voter registration and district assignments are housed in a state database, the assignments are made essentially only by local registrars’ offices. There is no standard state check on the assignments, which could have contributed to the assignment of at least 384 voters to the wrong districts in the Fredericksburg and Stafford areas during the Nov. 7 election. State and Fredericksburg officials were aware of similar problems at least two years ago, but did not launch a further investigation that might have uncovered the problems in the 28th, 88th and 2nd House Districts. On Nov. 7, 147 of the misassigned voters cast ballots, and Republican Bob Thomas won the 28th District race by just 73 votes over Democrat Joshua Cole. Democratic voters hoping a federal judge will order an election do-over are scheduled to have a hearing Friday. A random drawing to decide a separate tied race, which is expected to decide control of the House of Delegates, is scheduled for Thursday. “There will certainly be discussion about what role the state Department of Elections plays in confirming that [local elections officials] have done all the assignments correctly, and what to do if we find that people haven’t been correctly assigned, but, currently, that process happens at the local level,” Virginia Department of Elections Commissioner Edgardo Cortes said. The state does raise red flags when a street segment shows up twice, or with overlapping segments in the database, but no concerns emerged when street segments flipped back and forth multiple times over several weeks in Fredericksburg in 2015 and 2016. “My way that I would think about it is, ‘Is it right?’ You can see a lot of these were done on the same exact day almost at the same exact time,” Sasnett said. “We have a lot of localities around the state that don’t have the technology capability to go in and visually confirm all the assignments … when they do the redistricting process,” Cortes said. As the most populous county in the commonwealth, Fairfax County does have a full geographic information system department that can help Sasnett’s office. In the wake of the problems in and around Fredericksburg, the county is double-checking the voter registration database for any discrepancies, Sasnett said. “A lot of the issues that were pointed out … were from 2011, 2012, so it was after redistricting that those happened, and they’ve been there for years,” he said of the problems in the Fredericksburg area. The problems only emerged because an alert voter knew which race she should have been voting in, but given the confusing nature of legislative district lines even for some elections officials, the issues are not something that many voters would necessarily have been able to catch themselves. While voters are supposed to receive a notice any time their assignments change, checking voter registration status in the state’s online system only shows the registration as it appears in the database already; the official state lines are described in writing by the Department of Legislative Services, so there is no official map of legislative districts easily available. If the state relied on another system, such as Google Maps, and it was wrong, Sasnett said, registrars would be in a lot of trouble. “It’s not like Battleship where you pick one peg up and put it over to the other; it’s a lot of data entry, and yeah, your eyes get a little bit blurred,” Sasnett said. Voters who do have concerns, either now or after the 2021 redistricting, can call a local registrar’s office or legislator to try to get clarification. At the state level, Cortes said, the Department of Elections has asked for money for some system upgrades over the next five years that would include certain mapping technologies. Available technology for local registrars was different during the last redistricting, in 2011. “We didn’t have this capability, but now we have at least some limited capability that we brought on … in 2016 when we had to do the congressional redistricting because of another court case,” Cortes said. He expects the controversy over the 28th District election to lead to new discussions about what should be available during and after the 2021 redistricting. “What tools are they going to have access to? What are we going to do to make sure that when we do another statewide redistricting that we don’t encounter similar issues?” he said. The redistricting process includes lines for congressional, State Senate, House of Delegates and local government, such as council members or supervisors. In some cases when lines are drawn through a property, the local elections officials have to sort out a single house. The determination is made based on which district the master bedroom or main room of the house sits in. “When you’re talking about thousands of street segments, and then you have multiple residences on that … it does get a little bit kind of confusing, so it’s a lot of checking, triple-checking, quadruple — I mean, you go back and you try and check as many times as possible,” Sasnett said. For smaller jurisdictions with fewer people in the office, “A lot of it is just trust; it’s hope,” Sasnett said. Problems can come down to something as simple as a typo. 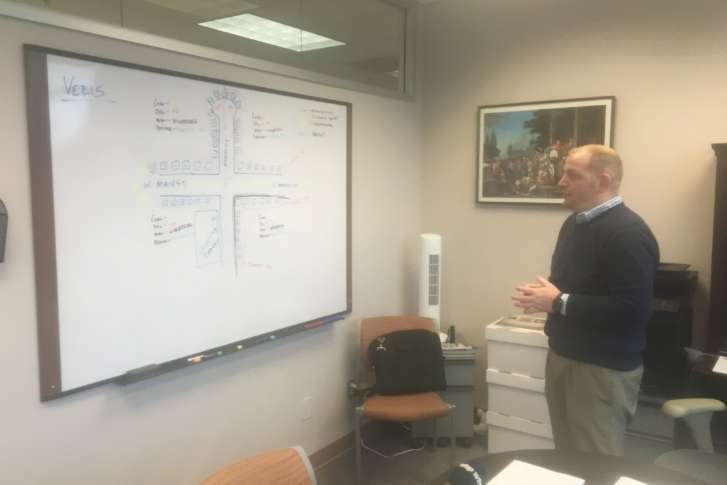 “This is a visualization of everything, but when we’re actually doing it inside of our system to maintain it, it is all done in sort of a grid, block, spreadsheet sort of thing,” Sasnett said, pointing back to the theoretical example on the whiteboard.